Check back here for the latest announcements about Rotaville. To follow-up with your own comments please post to the Rotaville General Discussion forum. The Shift Agreement feature has been fine-tuned add some new related Workforce Settings added. We encourage all Workforce owners/managers to check their Workforce Settings. On Rotaville we've just renamed Workplace to Workforce. Workforce is a more accurate and descriptive term and it help managers and Workforce Owners better understand what they are doing when they need to create a new rota or workforce. The new Workforce terminology is now being rolled out across all documentation, software, and mobile apps. NEW - Real Time Updates on web rota view. This exciting new feature makes Rotaville about 200% more awesome! On the web rota view (Work tab), managers will now see real-time updates to the rota whenever a change is made somewhere else. There is no longer any need to reload the page to see the latest up-to-date information. This is very helpful for workplaces with multiple active managers and workplaces with very active rotas. These real-time updates include changes made by other other managers such as new shifts being created and employees being assigned. Real-time updates for managers also includes real-time changes made by employees, such as updated availability, updated shift agreements, and new holiday requests. Real-time updates for managers will also be coming to mobile soon. New: record "Sick Leave" on the rota. Print and mobile updates. Until now there have only been two types of entries on the rota, shifts and holidays. Support for Sick Leave has now been added to Rotaville. Sick Leave can be recorded on the rota only by rota managers. When an employee calls in sick a "Sick Leave" shift can be added to the rota to record their absence. Recording sick leave helps rota managers when reassigning existing shifts by blocking out the employee. Recording sick leave will also let other managers and employees know that the sick employee is unavailable. Managers can click on the "Sick" menu tab to add a Sick Leave entry to the rota. For workplaces with multiple rotas, if a rota with the name "Sick Leave" or "Holidays" exists, then these rotas will be pre-selected in the add sick leave form. By default, employees can only see their own sick leave entries on the rota, but this can be changed using the new All Sick Leave visible to Employees setting in Workplace Settings. Managers can always see all sick leave entries. Employees can always see their own sick leave entries. In Settings, employees can choose to receive email notifications about their sick leave. In Settings, managers can choose to receive email notifications about sick leave entries for all employees. A new Sick Report PDF option has been added the Print menu tab. The Sick Report uses the same calendar year settings as the Holiday Report. so it's now possible to print the rota without holidays included, or just holidays and sick leave, etc. Version 51.X.X of the Rotaville Mobile App is now available on Android and shortly on iPhone. This update includes support for Sick Leave and many other small fixes and enhancements. The Rotaville Memo feature allows memo messages to posted to staff. A new setting has been added to Workplace Settings that controls who can post these memo messages. When the new Restricted Memos setting is set to Yes then regular employees are restricted to only posting memos to managers. When Restricted Memos is set to No then regular employees can post memos to everyone including other regular employees. Managers can always post memos without any restriction. The recently added include assignments options for repeating shifts have been removed. New shift assignment options have been added. 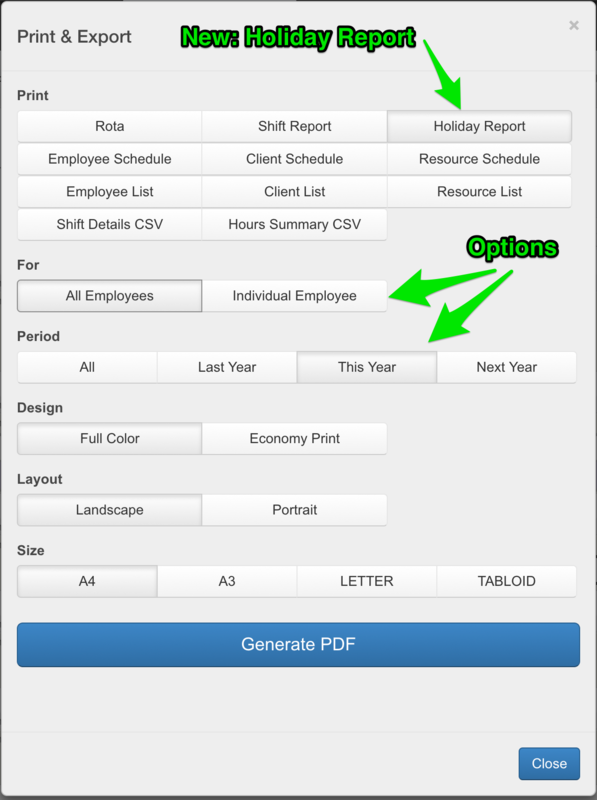 Now, when assigning employees ( or clients and resources ) to Repeating Shifts a rota manager can choose between a repeating Series assignment or Single shift assignment for just that shift. These new links/controls have been added to Rotaville web and mobile. The Rotaville rota system is only available in English Language but it works well for employees all over the world. A new Workplace Setting has been added to Rotaville, Show All Employees to Employees. This setting works in a similar fashion to the existing Show All Clients to Employees and Show All Resources to Employees workplace settings. When Show All Employees to Employees is set to "No, only show employees other employees they are working with" then regular employees will no be shown the fully employee list. They will only see the names of other employees that they are co-assigned with and also the names of all rota managers. For "agency style" companies, where employees don't know each other and don't work with each other, setting Show All Employees to Employees to No is a good idea. This new setting makes Rotaville an even better Agency Rota software solution. All new workplaces no have this setting set to No by default. Existing workplaces have this setting set to Yes. Rota mangers can go ahead and change this setting in Workplace Settings if they wish. Previously on Rotaville the only way to get notifications of updates to upcoming shifts and new shift assignments was to receive notifications about all future shifts. These old notification settings have now been removed. A new notification setting is now available that works for both Confirmed and Draft shifts. This new setting is restricted to only sending email notifications for shifts occurring a certain number of days into the future. A similar setting for push notifications about shifts will be available in the next update to the Rotaville App on mobile (which will be out in the next day or so). The Rotaville manual, after 7 years service, has now been retired. We'll add more docs and support notes to this new collection throughout the coming period. If you have any corrections, suggestions, requests or feedback then please get in touch. An updated version of the Rotaville App, version 47.2.0 , is now available for iPhone and Android. 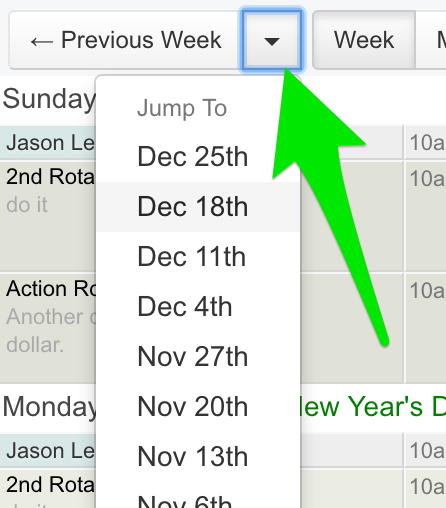 This new version includes the quick date navigation ( jump-to date menu ) function. 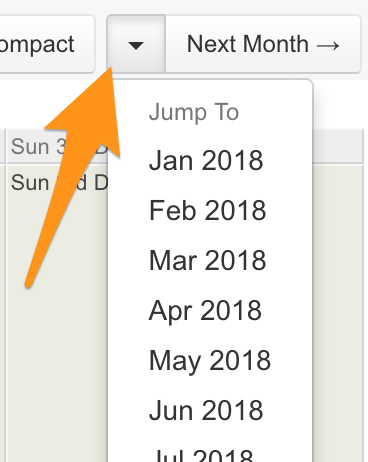 Using the drop-down menus next the Next and Previous week/month buttons on the web rota it's now possible to quickly jump to other weeks and months. New: Restricted employee view of Client Records and Resource Records. We've added some new Workplace Settings so that now, by default, employees only see a restricted list of Client Records and Resource Records. Employees will now only be able to see the names and details of clients and resources that have been assigned to work with. Rota managers will always see the full lists of Client and Resource records. If you'd like to go back to the old behaivour, where employees could see the full list of Clients and Resources then the Show All Clients to Employees and Show All Resources to Employees settings, in Workplace Settings, need to be changed to be "yes". New: Expanded Holiday Tracking and Reporting! Traditionally, the primary reason for adding Holidays to Rotaville was to assist rota managers with scheduling staff — by having them know who was away and therefore unavailable. Now, Rotaville can be used for tracking and reporting employee Annual Leave. Using another system for this is no longer required. Some new options have been added to Workplace Settings. "Holiday Allowance" is the default number of holiday days given to each employee. For all workplaces, this setting defaults to 20 days but it can be changed by any rota manager. The "Holiday Year Start Month" and "Holiday Year Start Month Day" allow a rota manager to change when each new holiday allowance year starts. By default the holiday year starts on January 1st but this can changed to any other date, e.g. April 6th, July 1st, etc. Another new setting has been added to each employee's Employee Record, "Holiday Days" can be used to override the workplace default for employees that have a different holiday allowance to the workplace default. As usual, shift information older than 12 months is automatically deleted from the system. However, now holidays will be kept in the system for 2 years so that reports can be run on the last holiday-year, the current holiday-year, and the next holiday-year. The Rotaville mobile Apps will be updated soon with these new settings. As you might have already seen, we've added a new control at the top of the web rota view that allows you to view Holidays Only or Shifts Only or the regular view of Shifts & Holidays. You could combine the Holiday Only view, with Month view, and with a filtered by-employee view to quickly locate Holidays and Holiday Requests for a given employee. We've changed the visual design of the employee record dialogs ( when viewing, editing, or creating a new employee, client or resource record ). Although this now looks very different, there has been no changes in functionality. Rota Managers are now able to quickly and easily view the historical Activity log for an individual shift or assignment by clicking on the Activity (heartbeat) icon in the shift details dialog box. More information and features will be added to these Activity views soon. These Activity views will also be coming to our mobile apps soon. Most users receive an email notification when a new memo is posted ( configurable in each user's personal Settings ). Email notifications are now also sent when a new response is posted to one of your memos.